Team San Francisco reaffirms its historical commitment to the long established and internationally recognized Gay Games as the preeminent quadrennial global LGBT multi-sport and cultural event. We believe unity behind the Gay Games is an effective and visible means of empowerment, and that continuation of the World Outgames would constitute a dilution of finite resources and a detriment to our community. Therefore, Team SF cannot and will not support any future World Outgames, and we welcome our fellow athletes and artists from across the globe to join us at the Gay Games. Factors cited by Team SF board members in their discussion included a notable registration decline since the advent of the WOGs in 2006, resources being stretched too thin to support multiple, competing events resulting in “tournament fatigue,” a desire to keep a mission focus on sports and culture rather than subsidizing conferences and parties, and Team SF’s historic ties to the Gay Games. Organizers of last year’s World Outgames in Copenhagen said they were unaware of the resistance to the WOGs or the difficulties they created for LGBT sports organizations. Team SF wants to make Antwerp aware of the situation well in advance. The Gay Games were born in San Francisco, where the San Francisco Arts & Athletics hosted the first two LGBT quadrennial global sports and cultural festivals in 1982 and 1986. 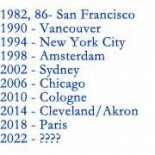 Since then the Games have been held in Vancouver (1990), New York City (1994), Amsterdam (1998), Sydney (2002) and Chicago (2006). This year’s Gay Games VIII will be held July 31-Aug. 7 in Cologne, Germany; and the 2014 Gay Games will be held in Cleveland, Ohio. When the decision was made by San Francisco Arts & Athletics to take the Games out of San Francisco under the newly created Federation of Gay Games, Team SF was formed with a mission to support Bay Area athletes going to the Games, and that historical connection shows in past registration numbers.